This collection is here to help those brides who want to have that unique look, but not necessarily have to pay the full custom fee nor spend the months creating that perfect suite (although, she’d love to!) And it's in a cute-as-a-button mini size! Take a look for yourself! And stay tuned! Throughout the launch period, I will be raffling off 6 additional pieces to those RAD brides who purchase during the launch period. You'll have until April 27th at 10pm Pacific Time to be eligible for the launch. I'll announce on a pretty awesome day (aka my birthday) April 28th! Today, the raffle giveaway is a custom Geo SnapChat filter for your wedding! Yay! 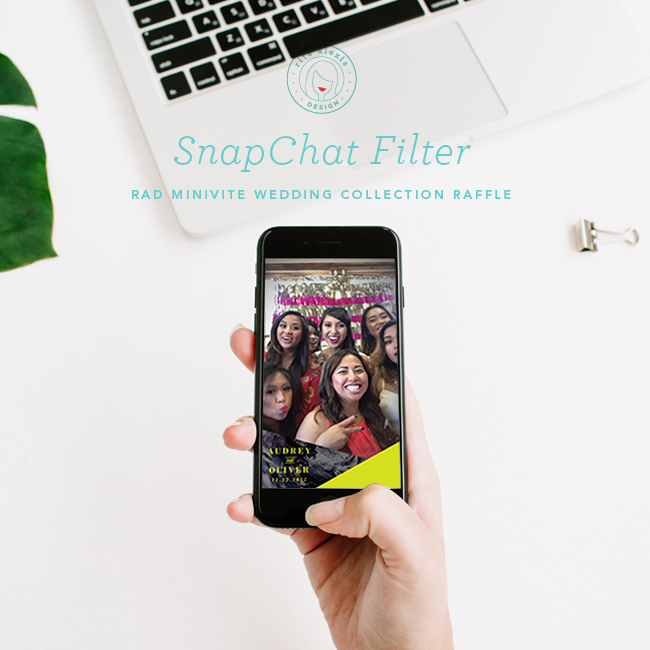 Purchase your RAD Wedding Minivite today for your chance at your own personally designed Geo SnapChat filter!